The first step in curbing any addiction is admitting you have one. So, with a deep breath, here goes: my name is Al McCloud, I’m 29 years old, and I love feeding paper into paper shredders. I know it’s wrong; I’m far too old to enjoy these simple pleasures. My addiction has got so bad that I don’t even check what’s on the page anymore. Festival tickets? Shredded. University Degrees? Shredded. Cherished family photos? Shred ‘em good. The paper shredder’s purpose (when not feeding my addiction) is simply to destroy data – and everyone, even our grandparents know this. Unfortunately for me though, the days of the paper shredder are numbered. Our data is moving almost exclusively online. 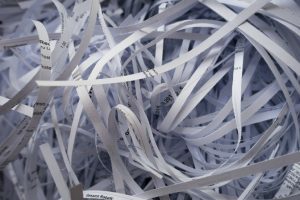 The process of protecting online data is not as easy as feeding an unsuspecting, crisp white sheet of paper into the beautiful shiny revolving teeth of a brand new, multi-speed, jam-proof, staple-proof cross-cut blade paper shredder, is it? No. Nor is it as satisfying. Believe me. As a tech community, it’s easy to take for granted how much we know about data protection and cybersecurity. We know that small amounts of personal information is all the fuel needed to power targeted ads, automation, and in the worst cases, cyber criminals. Big data expert David Buckingham says it best: “data is the new oil. We need to find it, extract it, refine it, distribute it and monetize it”. If we knew how valuable our personal data was before MySpace or Facebook swept the globe, would we have filled in our profiles with such detail? Probably not. And whilst we can take this knowledge for granted, outside of the tech bubble, the level of awareness isn’t as broad. Cifas, an independent not-for-profit organisation working to reduce fraud in the UK has released new figures which report a continued rise in identity fraud in the first half of 2017. So whilst our grandparents know how and when to use a paper-shredder (even if they’ve hogging it a bit recently) the online counterpart does not exist. Based on Cifas’ latest figures, battling fraudsters is a lot like playing whack-a-mole. Whilst there’s a decline in the two most popular forms of identity fraud (bank accounts and plastic cards) identity fraud is on the rise in the worlds of insurance, telecomms and online retail. Wherever there are blind-spots in security, that’s where the cyberattackers strike. Cifa chief executive Simon Dukes said: “Criminals are relentlessly targeting consumers and businesses and we must all be alert to this threat and do more to protect personal information. Identity fraudsters need two things – a piece of personal information and a channel to carry out the fraud. The internet provides both – fraudsters don’t need to riffle through your bins anymore – they don’t need to carefully sellotape thin strips of your bank statement back to together. That’s why it’s so important to protect your personal data and that of your customers. As we can see from the figures, battling cybercriminals and online identity fraudsters is not a job we’ll ever complete. It’s a new and constantly evolving responsibility. Good security practice is a habit to start getting to grips with now, and – once you’ve got the basics sorted – why not look at all the other ways you can protect yourself with UKFast?